The Herbert and Sylvia Fisher Student Center is named in honor of alumni Herbert and Sylvia Fisher, who established a $2 million endowed fund in May 2006 to maintain the center and support its programs. Herb (class of 1953) and Sylvia (class of 1950) have also generously supported a scholarship for education majors and a renovation of the baseball team’s field house. The Varsity Café, the dining area inside the Fisher Student Center, is named in honor of the Varsity, a Wilmington soda shop, grill and pharmacy that Herb owned and operated from 1953 to 1973. It was the “unofficial” student center for Wilmington College students for many years. The new 62,776 sq. ft. building is located adjacent to the Fisher University Union, Burney Student Support Center, Warwick Center and DePaolo Hall, creating a student services area in the heart of campus. 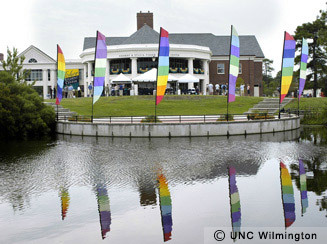 UNCW faculty, staff and students gather with members of the Wilmington community to celebrate the opening of the Herbert and Sylvia Fisher Student Center on August 24, 2006.